Incontinentia pigmenti is a rare X-linked disorder considered to be a syndrome of multisystem polydysplasias, commonly affecting the skin, eyes, central nervous system and teeth. It is caused by mutations in the NEMO (NF-κB essential modulator) gene, the protein product of which protects against tumour necrosis factor-α-induced apoptosis (1). The prevalence of incontinentia pigmenti is unknown (2) but the frequency is estimated at 1:40 000 girls (3). The condition is usually lethal in utero for males. The majority of the reported cases worldwide occur in Caucasian females. More than half the documented cases had a positive family history for incontinentia pigmenti (2, 3). 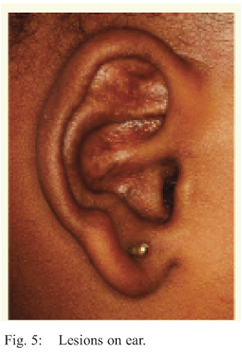 Clinical manifestations of the disease vary widely, even among family members (4, 5). Dermatologic findings are most often the first observed sign of incontinentia pigmenti. The natural history of the disease describes cutaneous involvement as following four stages: stage 1 can be seen from birth to four months and often presents with erythema, vesicles and blisters in a linear pattern on the extremities. 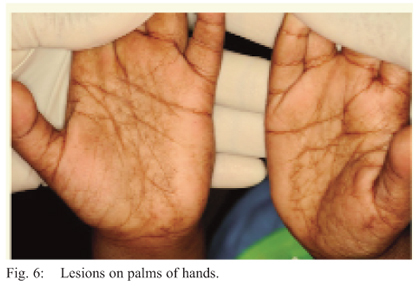 Stage 2 can occur from two weeks of life to six months and can manifest as hyperkeratotic papulae/plaques and verrucous lesions also on the extremities. Stage 3 is visible from 12 to 26 weeks and is characterized by hyperpigmentation. 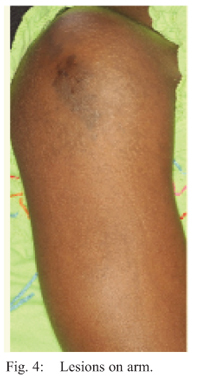 Stage 4 is entered thereafter and usually persists into adulthood as streaky hypopigmented or atrophic areas on the lower limbs that usually fade with time (2-6). All cutaneous lesions follow the Lines of Blaschko and may be 'S', 'V' or 'U' shaped patterns on the skin of the trunk and extremities. Other findings of incontinentia pigmenti include an eosinophilia which is a common accompanying haematolo-gical finding in stage 1 of the condition; sparse/fine hair and in some cases vertex alopecia, finger or toe nail dystrophy eg pitting and ridging, nystagmus, strabismus or cataracts affecting the eyes and convulsive disorders, mental and/or motor retardation that arise from central nervous system involvement. In more than 80% of patients, dental anomalies represent the most common non-cutaneous manifestation of incontinentia pigmenti. 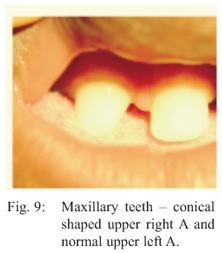 Hypodontia, microdontia (as pegged and conically shape teeth), delayed eruption and accessory cusps are frequently reported and both primary and permanent dentitions may be affected. To the authors' knowledge, this is the first documented case of incontinentia pigmenti in Trinidad and Tobago and indeed the Caribbean. 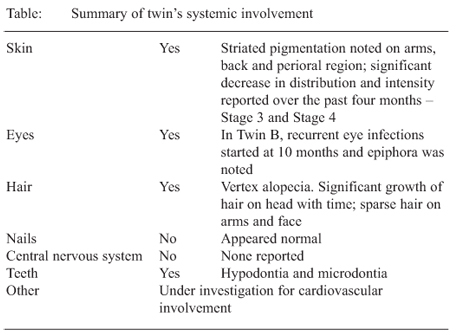 This case reports on 22-month old fraternal female twin girls of Afro-Caribbean descent presenting for dental consultation to a dental hospital in Trinidad. Twenty-two-month old twins A and B presented to the Child Dental Health Clinic of the University of the West Indies Dental Hospital with their mother and grandmother who were concerned about the relatively few teeth present in the children's mouths at that age and also the abnormal shape of the existing teeth. A comprehensive medical history revealed that the twin girls were diagnosed with incontinentia pigmenti soon after birth. The mother reported that pregnancy was uneventful and without complications. The girls were up-to-date with immunizations. There was no history of central nervous system problem, however, recurrent eye infection and epiphora (watering of eyes) were the ocular symptoms in twin B. The girls are still undergoing investigations on the cardiovascular system, as preliminary reports indicate some cardiac rhythmic anomalies (Table). There is no positive family history of this condition. Upon examination, striated pigmentation was noted on the perioral region, the ears, hands, arms and the torso and legs. The girls had very thin eyebrows and sparse eyelashes. 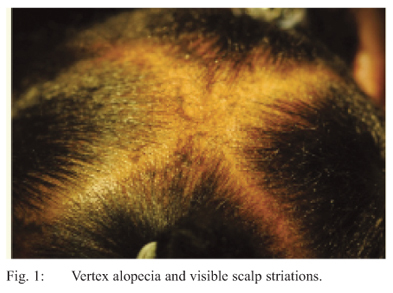 Vertex alopecia was noticeable (Figs. 1-6). The parent reported that there had been a significant (subjective) improvement in the hair growth and skin lesions over the past six months. Clinical photographs taken of Twin A are shown in Figs. 7 and 8. Clinical photographs taken of Twin B are shown in Figs. 9 and 10. No radiographic examination was undertaken. It has been well documented that there is an increased incidence of missing teeth in this condition. There was no justification for radiographic exposure of the twins at such a young age to confirm the absence of teeth. The diagnosis of incontinentia pigmenti relies heavily on the identification of the early cutaneous signs and an ability to distinguish the condition from other very similar conditions such as syphilis, ectodermal dysplasia, herpes simplex, impetigo, Langerhans cell histiocytosis, verrucous vulgaris and Goltz syndrome. 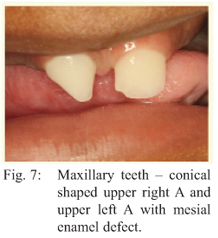 (4, 6-8) Observation of the subtle differences in clinical and dental manifestations along with genetic testing can lead to a definitive diagnosis (6). However, in the local setting, ready access to this valuable tool may be a limiting factor. Thus, many cases may go undiagnosed or misdiagnosed. The early diagnosis of incontinentia pigmenti and subsequent assessment of medical factors can impact on the long-term prognosis of each case. In the absence of ophthalmic and central nervous system involvement, the onus is now to monitor and manage the cutaneous and dental manifestations as may be required. The significant absence and malformation of teeth can affect proper facial development, mastication, speech development, appearance and self-esteem in the growing child (4). Parents should be made aware of the common occurrence of late eruption and missing teeth and the effects on the developing dentition. It is also important to ensure that the nutritional needs are being met (4, 6). The practice of thorough oral hygiene methods and healthy eating habits should be encouraged to help preserve the existing dentition for as long as possible. Although parents may have high expectations with respect to the provision of dentures so that appearance and esteem are improved, the various difficulties and challenges encountered in the provision of prostheses for such cases should be discussed. With parental support and an integrated and multidisciplinary approach, optimal results in aesthetics and function may be achieved (5, 6). It is proposed that review be undertaken every six months or sooner, if required. Any siblings should also be examined for dental anomalies. It may be prudent that genetic counselling be offered. Psychological support should also be available for the growing girls and their parents (6). Incontinentia pigmenti has significant dental manifestations requiring long-term follow-up and a multi-disciplinary approach to the management of afflicted patients to provide a functional and aesthetic dentition. We acknowledge that the availability of genetic testing to confirm the diagnoses of incontinentia pigmenti may lead to significant under-reporting of the condition in Trinidad and Tobago. 1. Jabbari A, Ralston J, Schaffer J. Incontinentia pigmenti. Dermatology Online Journal 2010; 16: 9. 2. Gurevitch AW, Farrel W, Horlick S, Hirose F, Reisner RM. 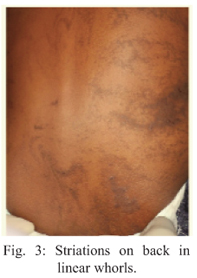 Incontinentia pigmenti - a systemic genodermatosis with striking cutaneous findings. Clin Paediatr 1973; 12: 396-401. 3. Carney RG Jr. Incontinentia pigmenti. A world statistical analysis. Arch Dermatol 1976; 112: 535-42. 4. BerlinA, PallerA, Chan L. Incontinentia pigmenti: a review and update on the molecular basis of pathophysiology. J AmAcad Dermatol 2002; 47: 169-87. 5. Kitakawa D, Campos Fontes P, Augusto F, Magalhaes C, Dias Almeida J, Guimaraes Cabral LA. 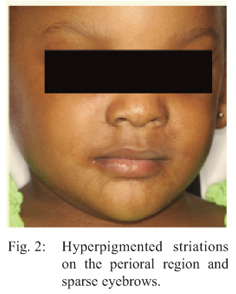 Incontinentia pigmenti presenting as hypodontia in a 3-year-old girl: a case report. J Med Case Rep 2009; 3: 116. 6. 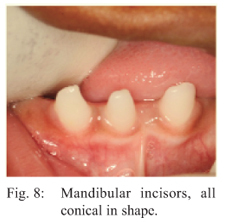 Macey-Dare L, Goodman J. Incontinentia pigmenti: seven cases with dental manifestations. Int J Paediatr Dent 1999; 9: 293-7. 7. Gorlin RJ, Pindborg JJ. Textbook of syndromes of the head and neck. NewYork: McGraw-Hill Book Company Inc; 1969: 319. 8. Sahn EE. Vesicularpostular diseases of neonates and infants. Curr Opin Pediatr 1994; 6: 442-6.